We are on the stage of History at a very exciting, interesting and troubled moment. In spite of astounding scientific advances which have created more material, wealth and comfort, the world is divided into two hostile, armed camps, each capable of destroying the other at short notice. Vast sums of money are being squandered on perpetuating a useless, senseless Cold war.......money that could be better spent on furthering the progress of man; not on seeking to bring baout his destruction. If we are to be free from the threat of massive and annihilating nuclear war, there must be some form of agreement between the two giants of the moment: the U.S.S.R. and the U.S.A. The peace-loving nations of teh world want an agreement whoch would create a better international order, making the necessity for large military budgets superfluous. The Middle and Far aest situations could easily spark off athird world conflict, and eberything that is sensible and practicanle must be done to lessen and ultimately end the tension existing in those areas. Meanwhile, we in British Guiana have ourown difficulties to face and overcome. Our unemployment is appalling and Government certainly has a considerable task ahead........finding regular employment for nearly forty thousand persons. In addition, large sums of mney are required for development projects. as was illustrated earlier in the year at the financial talks between the Colonial Office and a local delegation, we cannot and must not sit back and hope that Britain will pump millions and millions of dollars into this country. She cannot. In addition to other colonial financial commitments, Britain has to finance a large armanents programme as well as the expensiove social services of her Welfare State. Therefore we shall have to do at least two things: turn to other sources for funds and help ourselves more. Every effort must be made to expand the economy. The Tourist Industry, for instance, is a potential money-spinner. A secure and steady market is needed for our agricultural produce, rice in particular. But this commodity has recently becoem "a highly political substance" so I shall refrain from further comment,e specially since the controversial issue of Federation will eventually becoem involved. One last word. A quick end must be put to racasim. And it is here that Queen's College is in an almost unique position. It is a melting-pot of teh races and social classes of British Guiana and if the harmony that exists here could spread to every corner of the country, tehn something worth while shall have been accomplished. Unfortunately, separatist policies seem to be the order of the day, and this can only lead to ruin. Before any substantial progress can be made, e have got to weld ourselves into an unbreakable national entity with a strong Guianese outlook. tose who shout "Independence now!" should campaign for "Unity now!" instead. We must live and think as one people and forge ahead, or remain divided and in the present abyss of poverty an backwardness. STANDING (L TO r): Messrs. M.T. Lowe, H.A. Whittaker, C. Yhap, C.J. Barker, J.A. Rodway, C.I. Trotz, M. Grassie, J. Ramsammy, K.A.L. Brown, R.L. Clarke, R.C.G. Potter, B.A. Eyre, R.J. Moore, E.A. Wason, C.M. Boland, R.M. Jonas, R.E. Jackson, E.W. London, S.M.D. Insanally. SITTING (L to R): Messrs. R.M. Lall, S.E. Wilson, E.P. Clayton, P. Dial, N.E. Cameron, V.J. Sanger-Davies (Principal), D. Hetram, E.O. Pilgrim, Miss Akai, Messrs. C.E. Barker, G.H. Nrayan. ABSENT: Mrs. MacGregor, Miss L. Dolphin, Mr. L.W. Keates. Standing (L to R): W.H.A.L. Parris, A.N. Archer, M. Taharally, D. Ramharry, W. Ho, E.E.C.R. Brewster, F.R. Lall, L. Barran, M.I. Joseph, H.G. Rohlehr, R. Robinson, B. Boody, C.Payne, L.C. Roberts. Sitting (L to R) N.W. Layne, R. Langevine, J.A. Downes, C.M. Tang, O.M. Austin (Head of School), Mr. V.J. Sanger-davies (Principal), G.R. Insanally (Deputy Head od School), T.A.C. Fletcher, A.E.B. Wharton, V. Ward, MA.A. Khan. Standing (L to R): Mr. L.W. Keates, H.A. Chesney, Mr. E.P. Clayton. 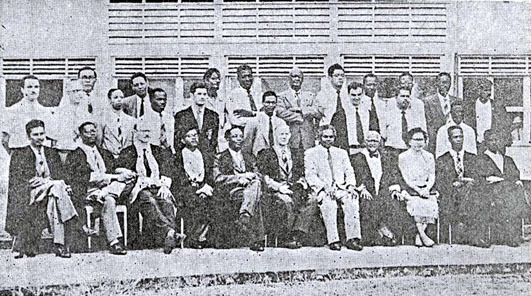 Sitting (L to R) W.A. Ramsahoye, K.M.G. Wishart (Editor), N.A. Robinson (Asst. Editor), W. Green. Abent:Mr. E.W. London, W.H. Bacchus. SIR EUSTACE WOOLFORD, O.B.E., Q.C., the oldest surviving Old Boy on celebrating his Diamond Jubilee as a member of the local Bar. Mr PERCY KING on being made a G.B.E. Mr. S.S. RAMPHAL on his appointment to te West Indian federation a s Legal Draughtsman. Dr. FRANK WILLIAMS on his appointment specialist in pediatrics in Nigeria. Mr. EDWARD GUNRAJ on his appoinment to the Bench. Mr. MILES FITZPATRICK, L.L.B.on obtaining his Degree and being admitted to the local Bar. Messrs: B.A.N. 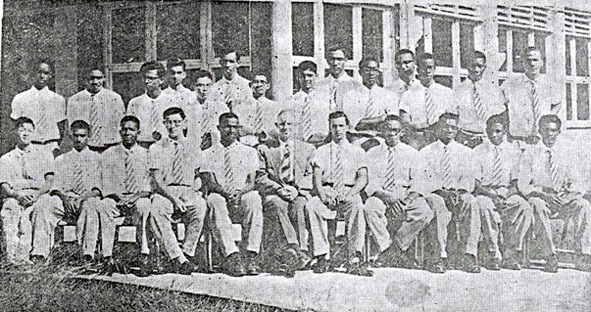 COLLINS and W.R. CHAN who were appointed to the staff of teh University College of the west Indies. 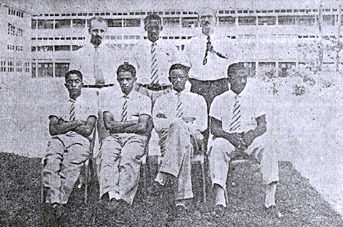 Mr. LAWERENCE TAITT (1950-1959)on his selection to represent the Colony at the 1958 Empire games held in Wales. Messrs: S.R.R. ALSOPP, B.A. (Hons. ), and J.J. NILES, B.A. - the former on obtaining his M.A. (with a Distinction mark); the latter on obtaining his B.Sc. Degree. GODFREY COOPER who left in 1953, scored 95 not outplaying for Dulwich's 2nd XI ina British School Cricket match. A.E.B. WHARTON on the award of a Demba scholarship. T.A.C. FLETCHER on the award of a Government Scholarship in Civil Engineering. .............And to all those boys who were successful at the annual external examinations.